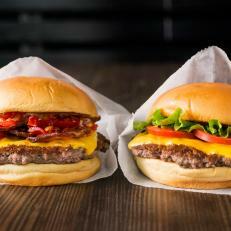 Billed as a “modern day roadside burger stand,” Shake Shack serves fries, milkshakes and concretes (a Midwestern staple that is denser and silkier than standard ice cream), in addition to its 100 percent Angus beef patties. This chain started as a seasonal hot dog cart in New York City, and its flat-top dogs continue to be a crowd favorite. But Claire Robinson patiently waits for the "perfectly delicious" corn dog that's offered only during selected times of the year.